Yard hydrants should be operated annually and flowed until all foreign material has cleared. This is a yard hydrant which had not been flushed for many years. 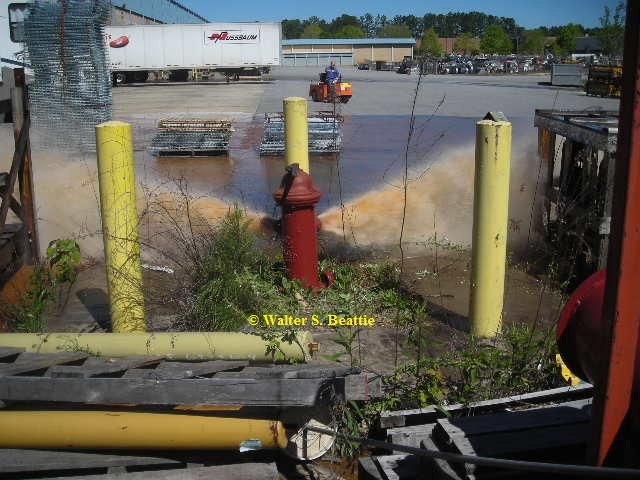 This hydrant has been flowing for 3 to 4 minutes when this picture was taken, and the water is still brown. Yard hydrants should be operated and flushed on an annual basis. Each hydrant in your fire system should be opened fully and flowed until all foreign material has cleared, but for not less than one minute. A good flushing to remove silt and particulate matter should be performed annually to clear the underground pipes of debris. This entry was posted on Wednesday, April 13th, 2011 at 6:28 pm and is filed under Uncategorized. You can follow any responses to this entry through the RSS 2.0 feed. You can leave a response, or trackback from your own site.